The Honorable Robert S. Smith (Ret.) is head of the firm’s appellate practice, and focuses on trials and appeals. Judge Smith joined Friedman Kaplan following his retirement as Associate Judge of the New York State Court of Appeals, New York’s highest court, where he served for more than a decade. During his time on the bench, he wrote scores of opinions and became well known for his judicial scholarship, insight, and intellectual rigor. Prior to his time on the Court of Appeals, Judge Smith practiced law in New York City, and was a partner with Paul, Weiss, Rifkind, Wharton & Garrison for over 25 years. He has argued dozens of appeals before the federal and New York appellate courts, and two appeals before the United States Supreme Court. His trial experience in complex commercial cases is also extensive. He is a Fellow of the American College of Trial Lawyers. 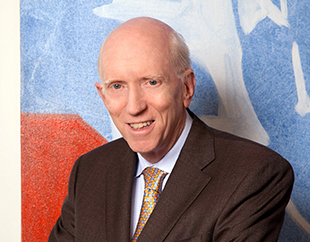 Since joining Friedman Kaplan, Judge Smith has been active primarily in appeals, trial-level commercial litigation, expert witness testimony, and alternative dispute resolution. Commercial Tenant Services v. Northern Leasing, 131 A.D.3d 895 (1st Dept. 2015). John Quealy Irrevocable Trust v. AXA Equitable Life Insurance Co. (2017 WL 2636366) (decided June 20, 2017 by the Appellate Division, First Department). Hellenic-American Educational Foundation v. Trustees of Athens College (2015-16) (New York County Supreme Court, Commercial Division). Town New Development v. Reuveni (2017) (New York County Supreme Court, Commercial Division). Camp v. Berman (2015-16) (U.S. District Court, Southern District of New York). Maitland v. Town Residential (2016) (New York County Supreme Court, Commercial Division). Lehman Brothers International (Europe) (In Administration) (UK High Court of Chancery, report dated June 25, 2015). American International Group v. Huaxia (High Court of Hong Kong Special Administrative Region, report dated December 21, 2015). Judge Smith has also submitted expert reports and/or testified orally in courts in Australia, Canada, the Grand Caymans and the Netherlands, and in an arbitration tribunal in the United States. Judge Smith has conducted several confidential mediations, and has been designated as an arbitrator in two proceedings. Judge Smith taught at the Benjamin N. Cardozo School of Law from 2006 until 2015, and taught at Columbia Law School from 1980 until 1990. He is the author of several articles, and a frequent speaker at bench and bar events.